U.S. Rep. Henry Cuellar, D-Laredo, has received $32,400 in political contributions from a company that operates immigrant detention centers — the second most of any elected official in the country this election cycle. Most recently, in March, Cuellar received two contributions of $5,000 from the GEO Group’s political action committee, according to Federal Election Commission filings. The GEO Group donation is Cuellar’s largest contribution from the 2018 election cycle. GEO, a company that specializes in private prisons on four continents, has made millions from U.S. Immigration and Customs Enforcement. The Florida-based business contributes hundreds of thousands of dollars to elected officials across the United States, with most of the top recipients being Republicans. ICE, at times in partnership with the U.S. Marshals Service, has awarded GEO contracts to run immigrant detention facilities in several Texas cities, which include Conroe, Karnes City, Laredo and Pearsall, according to the company. The group called its facilities “state of the art,” a characterization which immigration attorneys dispute. U.S. Rep. Joaquin Castro, D-San Antonio, has vocally opposed the private prison system, especially following the 2014 immigration spike over the U.S.-Mexico border. He declined to comment on Cuellar’s large fundraising haul, but upheld his private prison stance. On Tuesday, Department of Homeland Security officials said that 2,342 children were separated from their parents along the U.S.-Mexico border between May 5 and June 9 under President Trump’s “zero-tolerance” policy. Officials said they did not know how many had been reunited with their parents. Cuellar has stated he opposes separating families under the policy. 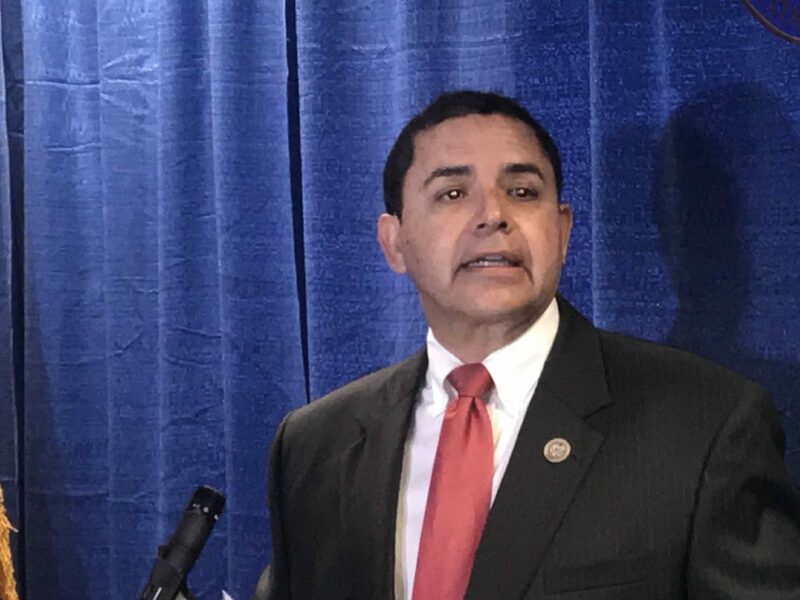 At a Monday news conference, however, Cuellar referenced a large number of children who crossed the U.S.-Mexico border without a parent before the policy was implemented in April by the administration, confusing immigration advocates and attorneys. “He makes our head explode,” an immigration attorney in the Valley said. Colin Strother, Cuellar’s campaign manager, said the “false narrative that somehow these contributions influence him is actually quite the opposite,” adding that Cuellar has vocally opposed families being separated at the border. Reps. Vicente Gonzalez, D-McAllen, and Filemon Vela, D-Brownsville, the two other members of the Rio Grande Valley U.S. House delegation, have also accepted money from GEO, though nowhere near the amount Cuellar took in. Gonzalez has received $2,500 in the 2018 cycle while Vela has collected $1,000. GEO has also given Sen. John Cornyn, R-Texas, $10,000 this cycle, the fifth-highest-funded elected official by the group. By comparison, Sen. Ted Cruz, R-Texas, has received $150 from the group. The top recipient is Rep. John Culberson, R-Houston, who received just $500 more than Cuellar, at $32,900. Vela declined to comment about Cuellar’s fundraising, but said he’s been approached by these private detention groups in the past. Gonzalez, who rebuked the administration repeatedly in recent days over the new policy, said private prisons should each be evaluated independently. But he also did not comment on GEO’s contributions to Cuellar. “It does not matter who is in charge of the facilities, whether it is the government or the private sector,” he said in a statement. Vela on Monday hosted various Democratic members of Congress for a roundtable discussion and tour of immigrant detention facilities in Brownsville, in which Cuellar did not participate. Gonzalez joined a separate Valley tour on Sunday where two U.S. senators and other members of Congress visited the U.S. Border Patrol’s immigration processing center in McAllen. Members of both groups on Sunday and Monday strongly condemned the separation of families.